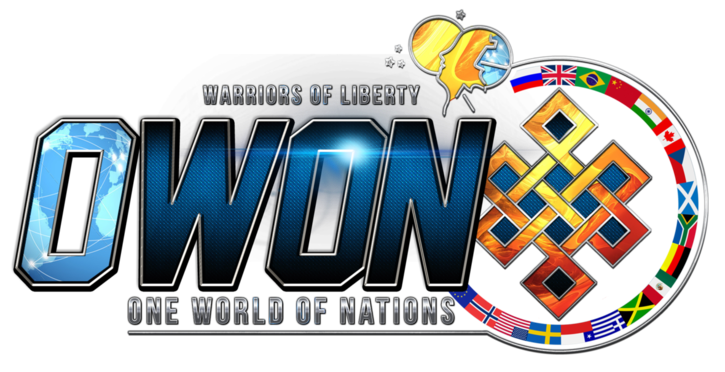 OWoN: So who are they invading next in their Global hegemony games. 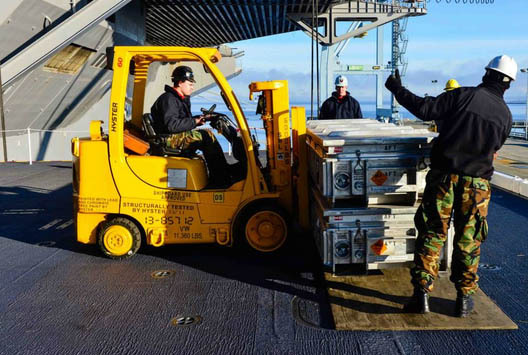 Aviation Ordnanceman Airman Joshua Haynes, from Nashville, Tenn., and Aviation Ordnanceman 3rd Class Joseph Dina, from Naperville, Ill., move BLU-111 500-pound bombs during an ammunition on-load aboard Nimitz-class aircraft carrier USS John C. Stennis (CVN 74). Nearly two weeks ago, we were surprised to read on the Navy's website that one of America's prize aircraft carriers, CVN-74, John C. Stennis (whose crew is perhaps best known for the following awkward incident), as part of an operational training period in preparation for future deployments, just underwent not only its first ordnance onload since 2010, but, according to Senior Chief Aviation Ordnanceman Jason Engleman, G-5 division's leading chief petty officer, "the biggest ordnance onload we've seen." The ship plans to take on two-thirds of its weight capacity during the three day evolution. 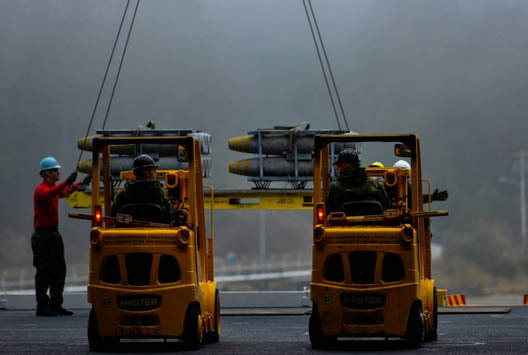 Bombs, missiles and rounds will be onloaded by 1,400 crane lifts. 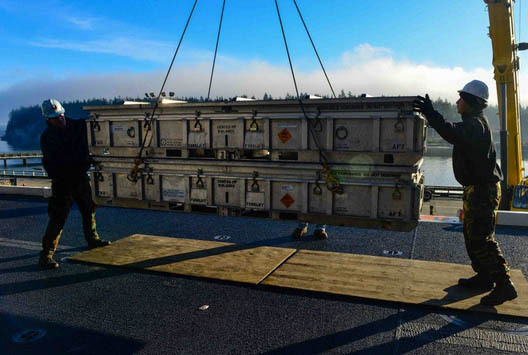 “The importance of the Indian Island visit is to provide ammunition for the ship’s defense, and assist with training during this underway,” said Lt. Cmdr. 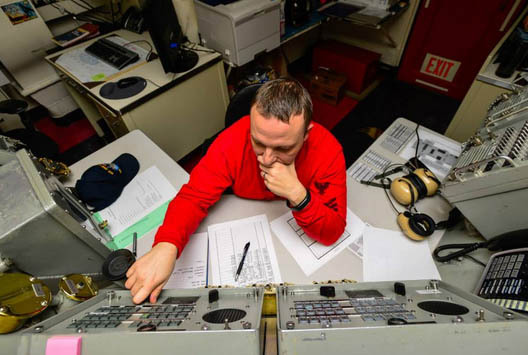 Steve Kashuba, Stennis’ ordnance handler officer. 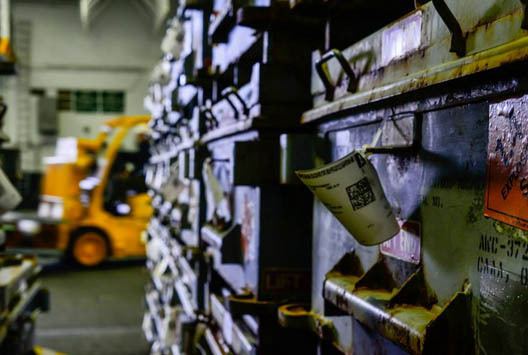 The ordnance onload was an all-hands evolution and included Sailors from AIMD, air, navigation, safety, security, supply and medical departments. 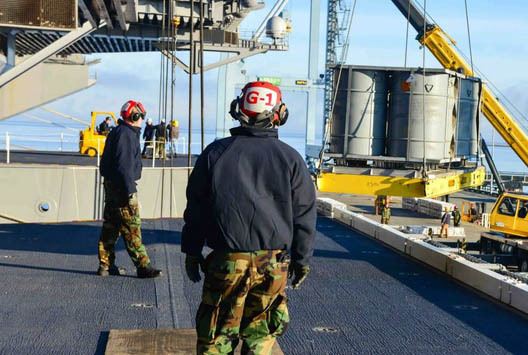 Sailors served as watchstanders, safety observers or ordnance handlers to ensure the evolution ran smoothly. 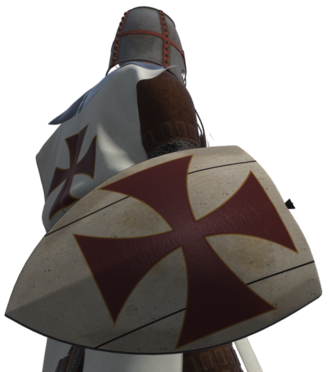 Why engage in such a major weapon loading process now? We don't know, and we certainly won't until the next deployment of the carrier, currently located in San Diego to receive aircraft and another 2000 sailors, is announced but it does seem coincidental that the same aircraft carrier which the Iranian General Ataollah Salehi warned back in Janiary 2012 "not to return to the Persian Gulf" was being loaded to the gills with weapons ahead of the following three major macro events: i) the sudden and unexpected fall of the US-supported Yemen government; ii) the biggest re-escalation in the Ukraine civil war since the spring of 2014, and iii) the death of the King Abdullah. 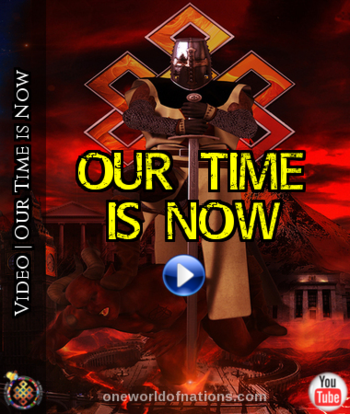 And who knows what other "unexpected" geopolitical events are about to surprise the world? 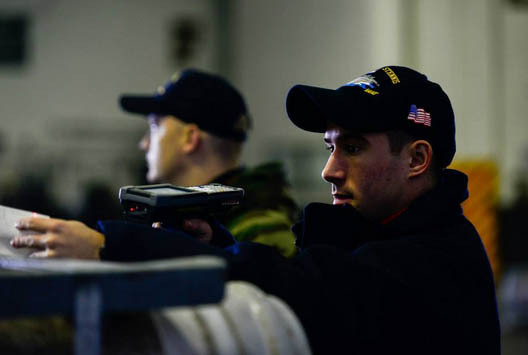 Aviation Ordnanceman 1st Class Donald Theriot, from New Orleans, verifies ordnance placement during an ammunition on-load aboard Nimitz-class aircraft carrier USS John C. Stennis (CVN 74). 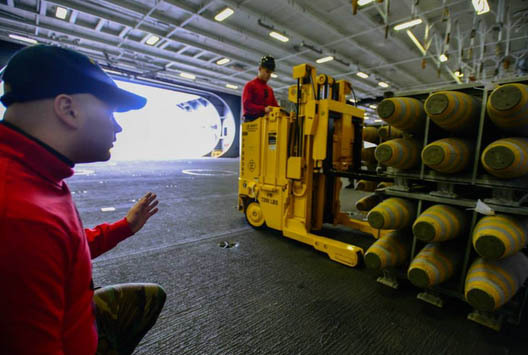 Aviation Ordnanceman 2nd Class Matthew Warren takes inventory of BLU-111 500-pound bombs. 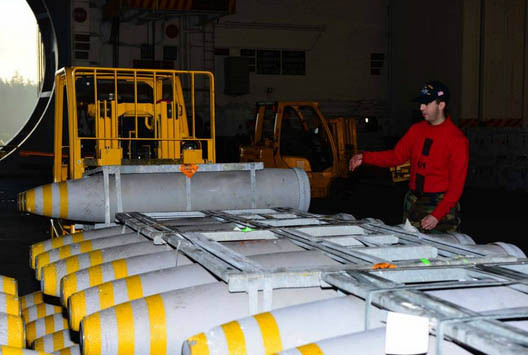 Aviation Ordnanceman Mariko Armstrong, from Denver, takes inventory of BLU-111 500-pound bombs. 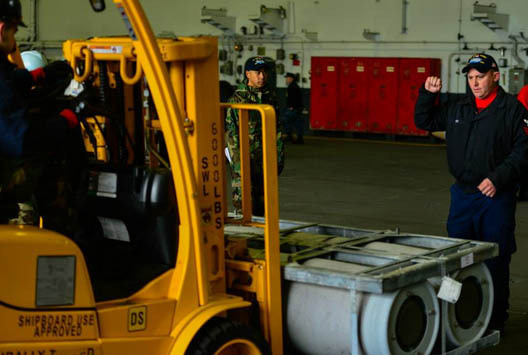 Aviation Ordnanceman 1st Class David Mele, from San Diego, directs movement of BLU-117 2000-pound bombs. 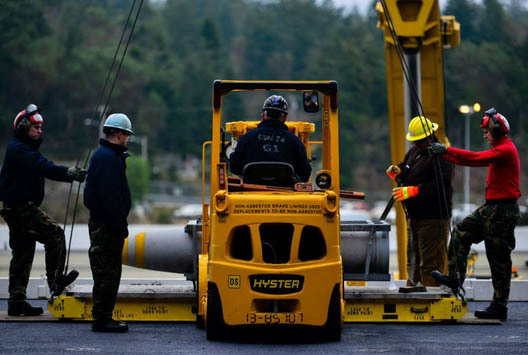 Sailors prepare to move BLU-117 2000-pound bombs. 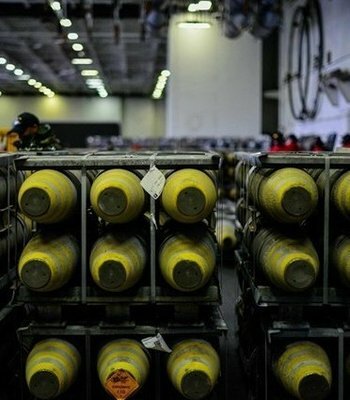 CBU-99 cluster bombs are staged during an ammunition on-load aboard Nimitz-class aircraft carrier USS John C. Stennis (CVN 74). 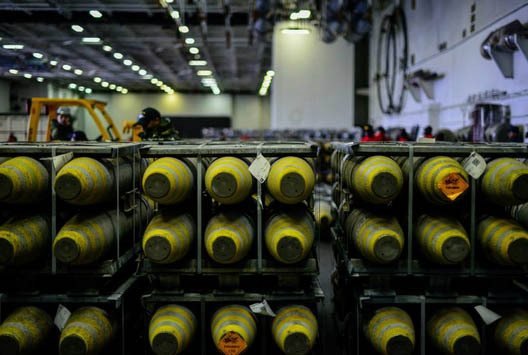 BLU-111 500-pound bombs are staged during an ammunition on-load aboard Nimitz-class aircraft carrier USS John C. Stennis (CVN 74). Aviation Ordnanceman David Black, from Helena, Ala., Aviation Ordnanceman 3rd Class Dillon Simmons, from Lewistown, Mont., and Aviation Ordnanceman 2nd Class Martin Pena, from Bronx, N.Y., prepare to move AGM-88 missiles. Aviation Orndnaceman 3rd Class Garrison Gardner, from Chandler, Ariz., and Aviation Ordnanceman 2nd Class Steven Paxton from Brian, Ohio, prepare to lower a mine kit. Aviation Ordnanceman 3rd Class Dillon Simmons, from Lewistown, Mont., and Aviation Ordnanceman 2nd Class Martin Pena, from Bronx, N.Y., guide AGM-88 missiles as they are lowered.